Thank you. it works now. but one question, can i use "set" function to mark a plot also? 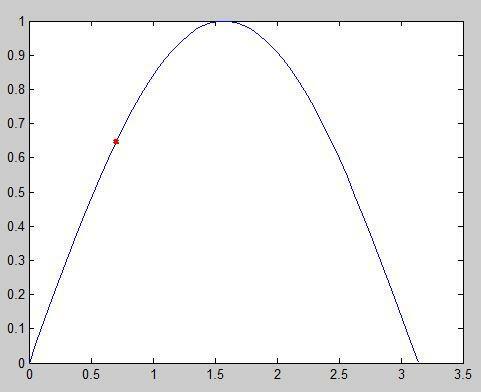 h = plot(NaN, NaN, 'r*'); %define the graphics object, but don't render anything. set(h, 'XData', x(20), 'YData', y(20)); %mark 20th point instead. With 7k views in a month, I'm surprised this hasn't been updated. In addition, you can specify the ‘o-‘ line style, which creates a solid line and markers. You can also specify marker properties, such as the face color and edge color. For R2014b or later (I would have to check about earlier; I see some references in 2012 time frame) you can use data brushing. Click on the paintbrush in the figure and then you can click on a point to mark it. This is probably a lot longer than you were expecting. You did not happen to provide information that we might potentially have used to make it shorter. For example if you know there is only exactly one line, and that the x were sorted when you plotted, and that the x value to mark is definitely in range, then the code could be made much shorter.